The Manchester to Glossop and Hadfield suburban electrification project, formed a part of the LNER's scheme to electrify the Manchester to Sheffield and Wath (MSW) route using the 1500V overhead DC system. World War 2 and the need for a new tunnel at Woodhead, delayed completion and the service did not open until 14th June 1954. Although the project was completed by British Rail (BR), the Glossop suburban stock was to an LNER design that was ordered in November 1938. 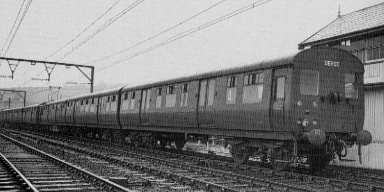 Eight three-car units were built using a design that was very similar to the Shenfield (AM6) stock. In order to take advantage of production line cost savings, construction of the Glossop stock started as soon as the Shenfield stock was completed. The Glossop stock is believed to have been stored at Ilford depot until the MSW electrification was completed. There were two chief differences between the Glossop and Shenfield stock. 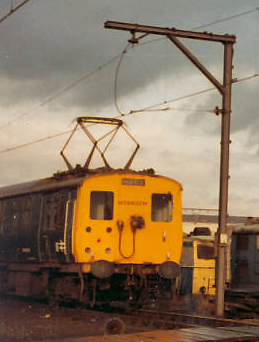 The Glossop stock used GEC electrical equipment and traction motors, in contrast to the Shenfield stock's English Electric equipment and Crompton Parkinson motors. The intermediate trailers also followed the original plan of having both first and third class accommodation. The Shenfield stock only had third class due to a wartime ban on first class accommodation on London suburban services. Birmingham Railway & Carriage Works Co. built the driving trailers, and Metropolitan-Cammell built the driving motor cars, and intermediate trailers. BR renamed third class as second class in 1956, and in 1960 the Glossop first class accommodation was downgraded to second class. In common with the Shenfield stock, electro-pneumatic brakes and five-lamp route indicators were fitted. The GEC motors were initially quoted as 210hp, but later diagrams prepared by the London Midland Region quoted them as 133hp. Unlike the Shenfield stock, the Glossop stock was never converted to AC operation. The Glossop stock spent virtually its entire life operating the Manchester to Hadfield and Glossop section of the MSW line. Exceptions included routine visits to Horwich Works for maintenance, and acceptance trials at Ilford. The only passenger-carrying exception was in June 1954, when they operated a shuttle service between Woodhead and Dunford Bridge for visitors to the new Woodhead tunnel. In September 1957, the Glossop stock was used for comparative hammer blow trials between Sheffield and Wharncliffe. BR classified the Glossop stock as Class 506 in 1968. The Woodhead route was abandoned in 1981, resulting in the closure of the Reddish depot in May 1983. The Glossop line remained open, and the Class 506 units were moved to Longsight Electric depot. A Class 303 unit caught fire in the depot in November 1983, and this damaged two cars of Class 506 unit 06. The entire unit was withdrawn. One year later, units 01 and 02 developed problems, and the working cars were combined to create one functioning three car unit. The Glossop line was the last functioning 1500V DC system on the BR network. Replacement became necessary during the 1980s, and it was converted to 25KV AC in late 1984. This resulted in the withdrawal of the remaining Class 506 units. The last Class 506 ran on 7th December 1984. No complete Glossop Class 506 units survive, but one cab resides at the Barrow Hill Roundhouse. Although there are no kits of the Glossop Class 506 units, it should be fairly easy to adapt the Bill Bedford 4mm scale kit of the Shenfield AM6 units. Thanks to Mike Bennett for the "BR Blue Era" photograph of the Glossop Line Class 506 electric multiple unit.